Indian Head is a small, waterfront town situated on a peninsula in southern Charles County, just 30 minutes from Washington D.C. Known in the 19th century as the Indian headlands, the town was incorporated in 1920 because of its proximity to the area’s naval base, now home to the Indian Head Naval Surface Warfare Center. The small community is just over one square mile in size, and is currently home to approximately 4,000 people. While Indian Head isn’t known for its extensive shopping and dining options, the communities close by are considered some of the most attractive in the state. Just a short drive away from Indian Head is the St. Charles Towne Center Shopping Mall, a two-story shopping center home to Macy’s, Kohl’s, JC Penney, Sears and more. Looking for something a bit more unique? Check out the locally run shops in La Plata. 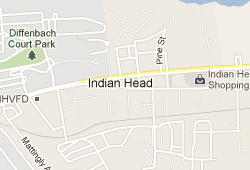 For daily essentials, residents can head over to the Indian Head Shopping Center. Indian Head’s waterfront location makes it a prime destination for water activities, including some of the best bass fishing on the East Coast. Residents love to spend their days and evenings kayaking, canoeing, bird watching, and fishing along Mattawoman Creek. Boat owners can easily access both the Potomac River and the Mattawoman Creek from the town’s docks and ramps. Just 10 miles away, on the opposite side of the Creek, is the 630-acre Smallwood State Park. Visitors to the park can set up camp, rent boats, and hike along the waterfront. The newly opened Indian Head Rail Trail features a paved 13-mile path that runs from Indian Head to White Plains. Residents can also swim year-round at the Henry E. Lackey High School pool. A small, hometown feel is important to the residents of Indian Head. Community events and activities are a great way to spend a summer’s day or Sunday night. The newly opened Indian Head Center for the Arts is home to the Black Box Theatre, a local favorite. Seasonal town activities, such as 4th of July fireworks, summer sing-a-longs, and the annual tree lighting, take place in The Village Green, located at the southern end of town. An eclectic array of housing options awaits those relocating to Indian Head. New townhouses and single-family homes lie next to cozy 1920s-era bungalows and farmhouses. Ramblers from the 1950s and 1960s are also prevalent. Median home value in 2009 was $227,027. The Charles County Public Schools system operates two elementary schools, two middle schools, and one high school in Indian Head. There are also two private schools that serve children from pre-kindergarten through grade eight. While there are no institutions of higher learning within the Indian Head town limits, several universities, including George Washington University and Georgetown University, are within an hour commute. The nearest emergency room, Civista Medical Center in La Plata, is often ranked as one of the best of the state. There are three Amtrak stations located within 10 miles of Indian Head: Woodbridge, Lorton, and Quantico. VanGo provides convenient transportation from Indian Head to nearby shopping malls, and commuters can catch a ride into downtown D.C. on the Metro bus lines.